Pedal powered Royal Enfield tricycle and trailer. Royal Enfield motorcycles carry you through time as well as distance. They transport you back to, oh, say, 1951, when traffic moved slower and a single-cylinder 500cc motorcycle gave you freedom to roam. But here's a pedal-powered Royal Enfield tricycle, for sale on eBay, that offers to take you back to a time before internal combustion. 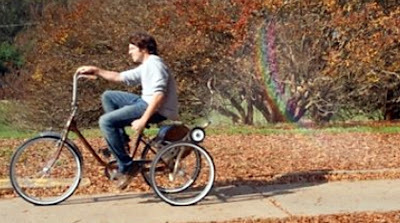 This trike and its whimsical tear-drop trailer are completely impractical for travel anywhere — not least because their purpose is to generate a rainbow as they go. 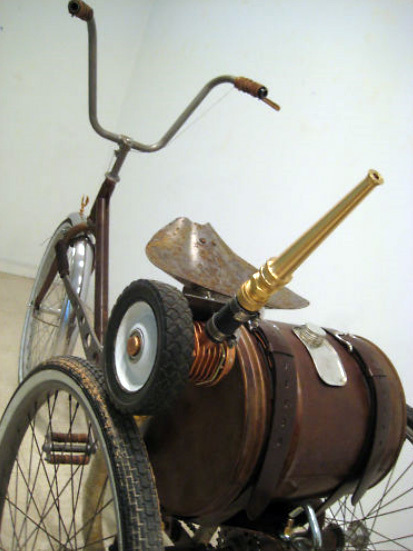 Pump geared to rear wheel, spray nozzle. That's right. 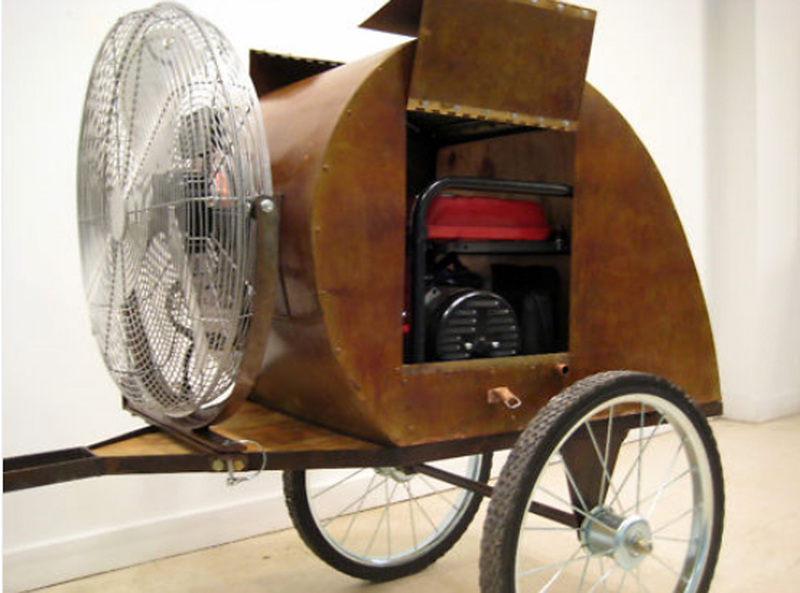 A pump geared to the left rear wheel of the tricycle is supposed to shoot water from a tank between the rear wheels into a breeze generated by a fan on the front of the trailer. A generator inside the trailer powers the fan. "Under the right conditions" a rainbow is created and, presumably, the rider gets soaked. Like something out of Willie Wonka, this silly yet very clever machine evokes the "steampunk" movement. Steampunk. I had to Google it. It is H.G. Wells style fiction, complete with steam powered dirigibles and computers powered by clockwork springs. Practitioners dream of an alternative reality, when Victorian England set the rules of behavior and steam power set the pace of progress. Workmanship from a previous century. In such a time, what could be better than a mobile rainbow generator? This one, for sale in Redding, Conn., was originally part of a public art performance, the seller writes. 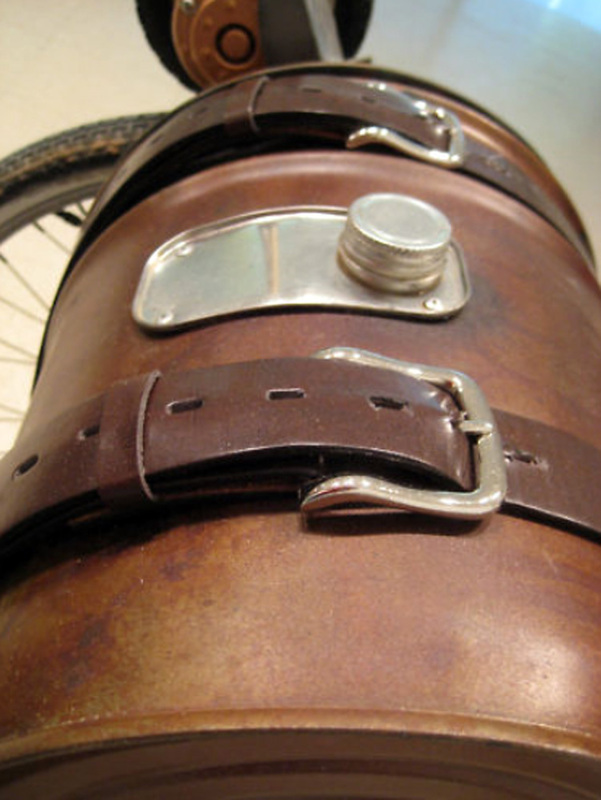 Still rideable, it is finished to 19th-Century standards, with leather wrapped grips and pedals and leather belts holding the water tank in place. Tricycle sports a Royal Enfield badge and a fender ornament. 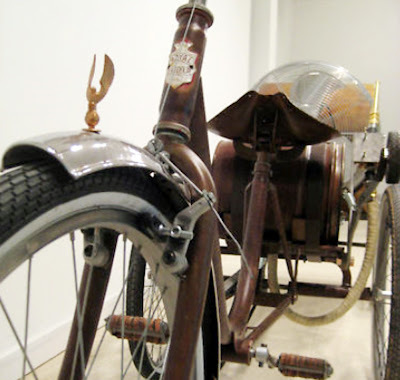 For the original artist, the fact that this is a Royal Enfield tricycle must have had a special appeal. Never mind that these Royal Enfield tricycles are made not in Redditch but somewhere in Asia, perhaps Japan. For use on pedal powered machines, the name "Royal Enfield" was sold on long ago, and has no relation to the motorcycles now made in Chennai, India and, before that, in England. eBay's Buy It Now price is $2,200. The seller crassly suggests that you replace the tank with a beer cooler and go to tail-gate events. What, and destroy a timeless piece of history? Generator powers the fan, not the vehicle. The world has many SUV tail gates to choose from; it is seriously short of rainbow generators. I am indebted to Emile Lapointe of Toronto, Canada, who pointed out the eBay ad on the Royal Enfield Bulletech message group. Yes, it works! See the rainbow? What is the trailer with the fan for? Keeping the rider cool? Nice find! The trike is clearly of recent manufacture - at least the front fork and brake. They are a design that started in the 1980's and continues today. It looks like the rear end is bolted to a regular bike frame, but the pictures are not very clear. This is not mass produced item. It is clearly a one-of-a-kind piece. Note the hard seat. Also, the lack of rear brake. Probably built to one-mans specification for entertainment. 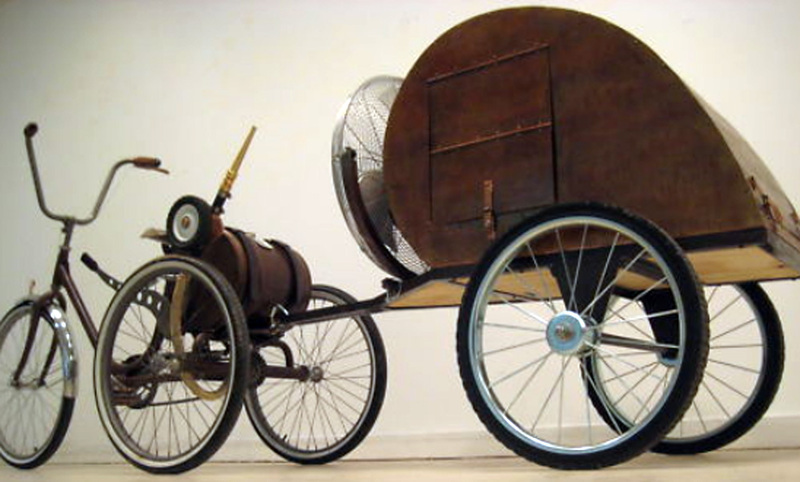 It would be great to ride this unit around an amusement park generating rainbows and smiles as you go. I love it. Jorge Pullin has done some research into these mysterious tricycles on his blog My Royal Enfields at this link. But some questions remain. Can any bicycle shop owners out there tell us where these things came from? I just picked one up yesterday. I immediately noticed the large drum brake on the front. Today, checking it out, I also found the unique rear axle drive. The fellow said it was a Royal. After I got it home and under some light it was clearly marked Royal Enfield and it is good condition. The basket is rough but my wife's trike has a basket. I'm going for the 'sportster' look. Anonymous, please send some pictures and description as your "sportster" takes shape.